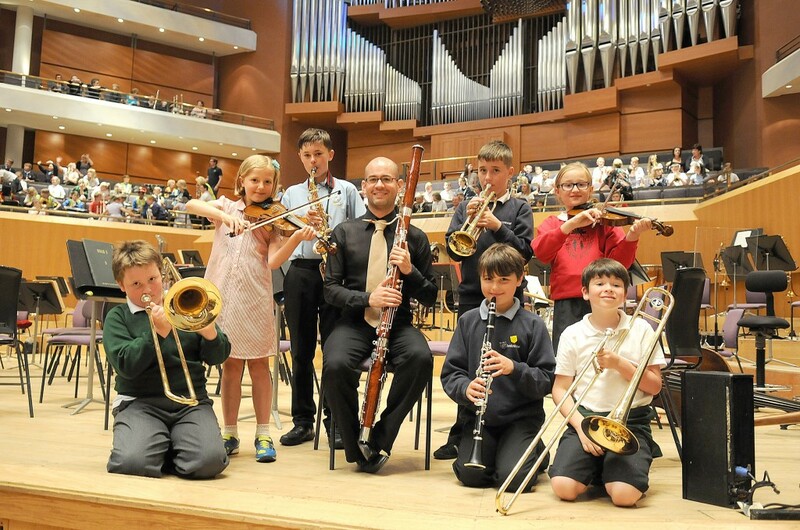 1 July 2014 – Manchester’s Bridgewater Hall echoed to the sound of more than 1,400 young musicians from Cheshire West as the world famous Hallé Orchestra hosted their ‘Come and Play with the Hallé’ event. Forty schools from across the Borough came together for this highly popular concert, which is the culmination of a year’s tuition on the ‘First Access’ instrumental learning programme, delivered by the Quality Learning Partner Music Service. Music Service Leader, Alison Corten said: “This event is the highlight of our year. Throughout the event, pupils were treated to a selection of famous orchestral works as well as music from the big screen – the repertoire stretched from Nimrod from Elgar’s Enigma Variations to an exciting selection from the “Pirates of the Caribbean” film score by Klaus Bedelt. The undisputed highlights of the concert were the two numbers in which the professional musicians of today joined forces with the potential musical stars of the future. Over the last few months pupils have been busy preparing their own specially written parts to Tito Puente’s Ran Kan Kan and Dolly Mixtures, written by Steve Pickett, the Hallé’s Education Officer so that they could play along with the world famous orchestra. They also sang a song by Steve Pickett, to coincide with Glasgow’s Commonwealth Games, and produced a moving rendition of “Believe” by Linn Marsh. Kyle Finch (Woodlands Primary School, Ellesmere Port), Anna Roberts (Farndon Primary School), Jamie Cavanagh (Rivacre Valley Primary School, Ellesmere Port), Ben Hudson (Halle Orchestra), Michael Thomson and Ryan Swartz (Westminster Primary School, Ellesmere Port), Alyssa Pridding (Farndon Primary School) and Billy Quirk (Woodlands Primary School).